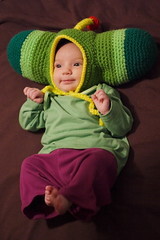 Itchy Stitchy: FO and Pattern: Katamari Damacy Prince of All Cosmos Baby Hat! 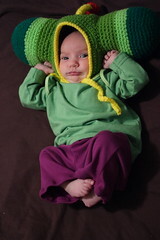 FO and Pattern: Katamari Damacy Prince of All Cosmos Baby Hat! -spring/medium green (RH Designer Sport)- if you use worsted for everything, there are numbers in parentheses for you to use instead. With medium green, ch 56 (42), and turn. Starting with 2nd ch, sc back across chain. 55 (41) st.
Sc back and forth through both loops for 18 (14) rows, break yarn, and fasten off. The bound-off side of your crochet is where you’ll be resuming your work. Imagine it divided into three sections: 18-19-18 (14-13-14) st. You’ll be working the center 19 (13) st, crocheting the st from the side sections together with the last st of each row to make a half-box shape, like a cube with the front and bottom missing. On 19th (15th) st in, attach yarn and ch 2. Sc for 16 (12) st, and then dec (insert hook into next st, yo and draw loop through; insert hook into next st, yo and draw loop through, yo and draw yarn through 3 loops on hook- 1 st decreased). *Ch 1 and turn. Sc back across the row you just did (it’s 19 (13) st total), but when you get to the last st, dec, using the last sc of your row and the st from the row below. * Repeat from * to * until you run out of st from the row below- it’s going to get box shaped as you go. This is the same concept as turning a flap heel on a sock, if that helps. With yellow, ch 4, sl st in first chain. 6 sc into loop. Sc, dec, break yarn and draw through loops. With dark green, ch 4, sl st in first ch to make a loop. Sc around for 5 rounds. Switch to light green and sc around for 4 rounds. Switch to med green (held doubled if you’re using sport weight) and sc around for 5 rounds. Sl st in next st and fasten off. Using whip st, sew antenna to top center of bonnet with yarn tail. Lightly stuff head bumps and sew to sides of bonnet, using photograph to help center them. They will overlap onto the back panel a little bit. Using yellow yarn, ch 30, then sl st around front opening of bonnet, starting on left side (facing the hat), ch 30. You should be working across the right side of the bonnet. Sc back over ch and sl st through back loops- this makes the ties and frames the front of the bonnet. Weave in ends and enjoy! My baby loves wearing her hat and enjoys bopping the padded sides against things- it’s like a little baby helmet. In order to make the bonnet wider, ch more than 55 st to start. To make it deeper, work more sc rows before fastening off and crocheting the back. 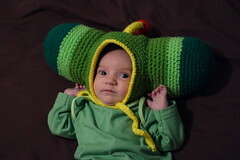 In order to make a grown-up size, make a bonnet to fit the recipient’s head. Make the antenna a little longer, and continue crocheting the end of the head bumps using *x sc, 2 sc in one st*, increasing x on each round by 1. You’ll increase the length of the ties, too. I love language. I love knitting. I love photography. I love my husband. I love my daughter. I love my puppies. Reach me at vmachak at gmail dot com. Please don't take my photos without asking. Seriously- just ask. You can email me at vmachak (at thingie) gmail (dot thingie) com!